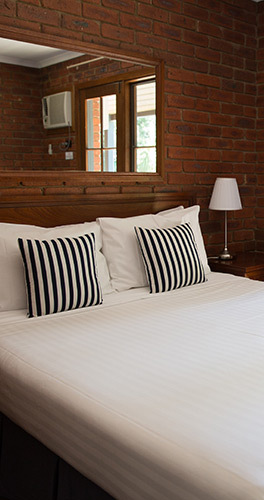 The following motel accommodation packages are exclusive to The Armour Motor Inn, Beechworth. Package offers are for direct bookings with The Armour Motor Inn. Please note that bookings via a third party online booking site attracts a 10% surcharge. Use your Seniors Card, and book your train journey from Southern Cross Station to Wangaratta, where a bus awaits to bring you directly to Beechworth. (approx 3½ hrs). Then stay with us at the Armour Motor Inn, which is located 150 metres from the bus stop and we can arrange transportation if needed, on our Midweek get out of town package listed above. Feel free to call us 03 5728 1466 if you would like any special arrangements made for you. The Spa Beechworth - With every booking between Sunday and Thursday, guests are eligible for a $30 voucher to the Spa at Beechworth. Bookings must be made in advance and online via their website. Vouchers can then be collected upon check in at the Armour Motor Inn. Beechworth Bus Lines - available for town and winery tours, bike trail pick up and charter services phone 03 5728 2182 or email for further information. 12 seater to 57 seater buses available for charter. Going to the snow for a weekend, a week or longer? Break up your trip from Canberra, Sydney or Melbourne to or from the snow fields and arrive refreshed by staying with us at the Armour Motor Inn. Mid Week Packages available. Beechworth is approximately 1½ hours scenic drive from the Victoria’s High Country snow fields, Falls Creek, Mt Hotham, Dinner Plain and Mt Buffalo. Call us to talk about your accommodation needs.